As the mother of a 10-year-old Minecraft addict, pixelated cubes are now a part of my life. When I chaperone school field trips, I hear a lot of rapid chatter about Creepers and red stone and the Ender Dragon. I’ve tried to play Minecraft and realized that you have to invest a bit of time to get good at it. I don’t have time to play video games in this phase of my life, so I’ve resigned myself to being pretty terrible at Minecraft and living vicariously through my daughter Abby’s video game adventures. Last April I made Abby a creeper t-shirt and she liked it even though it wasn’t completely accurate. (The video tutorial shows how to make the more accurate design.) Abby accepted the shirt with excitement and told me how to tweak the design to make it more realistic before I made four more before a summer birthday party for her cousins. This is an easy project to do and could be paired with a pair of sweatpants to create a fun Halloween costume that could be worn all year round while playing Minecraft. These also make great gifts to for young Minecraft enthusiasts. 1) Out of the black jersey knit, cut two 3″ squares for the eyes, a 3.5″ square for the nose. Than cut another 3.5″ square in half and place those rectangles on each side of the nose block starting about half way down the block. 2) If you’re using interfacing, iron it on to the back of each black piece of fabric. and then iron in place on the t-shirt. If you’re not using interfacing, pin each black piece of fabric in place. 3) Sew each piece black piece in place, circling around twice close to the edge to make sure each piece is secure. 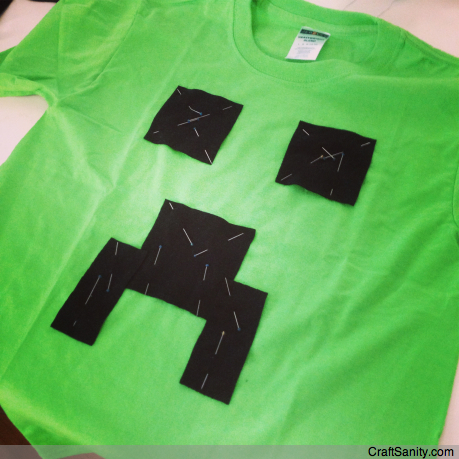 4) Cut thread tails and remove all pins and your Creeper shirt is ready to sport around town. Greetings! Quick question that’s entirely off topic. Do you know how to make your site mobile friendly? My weblog looks weird when viewing from my iphone4. I’m trying to find a theme or plugin that might be able to fix this problem. If you have any recommendations, please share. With thanks!